I'm back & normal service will be resumed as soon as possible! It's a little A6, CAS card. The base is Adorable Scorable card in pink. and the digi image14703 (539) Daisy Swirl twice. & to draw a little border to create a frame. A few little self adhesive gems were the only embellishments. I hope to see you playing along in the challenge too! Very pretty card Dawn, love the sentiment and the border frames it beautifully. This is a really pretty CAS and i love the sentiment. Beautiful card Dawn, I love the sentiment. 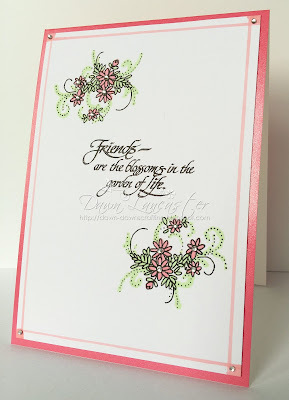 Such a pretty card Dawn, a fabulous CAS design. It's so beautiful, Dawn! Love the CAS style and the wonderful sentiment. Let me put on a DT hat while I'm here - I'm really tickled to see you playing along at Quirky Crafts this month. :-D Good luck. Such an exquisitely elegant card, Dawn! Wow!